There’s a lot of differences between typical parenting and special needs parenting. There’s lots of ups and downs and there’s a lot of things that as a parent, you need to accept. But, I think one of the most wonderful parts of being a special needs parent is finding the joy and excitement in everything, because everything is a big deal with special needs parenting. You know when you first watch a baby discover their toes and they just get so excited by them? And it’s freaking adorable? Ella has just discovered her toes. In her crib, she rolls around playing with her toes, giggling, and having a great time. It’s amazing. This is a girl who used to have almost permanent stick-straight legs. Now, she sleeps with her feet pushed together and her knees turned out. I used to watch Raegan in the stroller, wildly thrashing her legs around, and Ella’s would be still. There’s no constant reminder of how different your baby is than having a twin. You’re forced to confront things every day that make you sad, wistful, and damn-well pissed off. Ella playing with her toes! For most people, the grocery store is a normal place. And most parents don’t think twice about bringing their kids with them, in fact, it’s almost a necessity. But, with a baby who can’t sit up in a cart, it’s pretty impossible to take them to the grocery store. But, thankfully there are some really amazing people who make things that adapt the world for every baby, instead of adapting the baby. 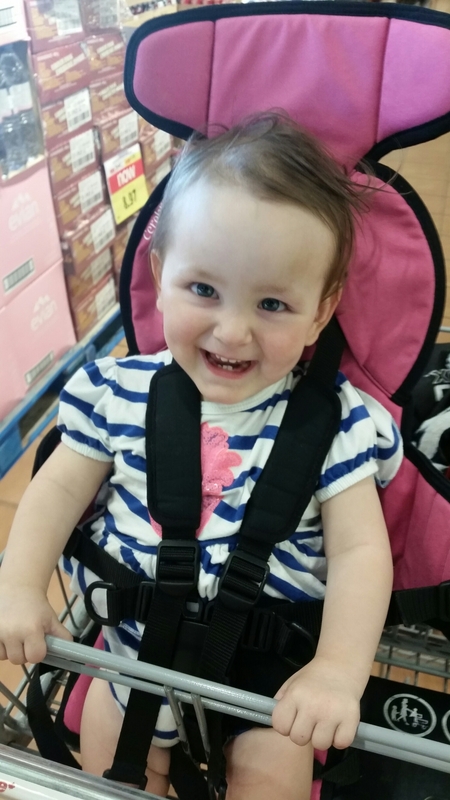 So, with Ella’s special pink chair, she was able to sit in a grocery cart for the very first time, and she loved it. I could see people looking, wondering, but one look at that smile, and everyone seemed to change dispositions, she literally spread happiness throughout the store. 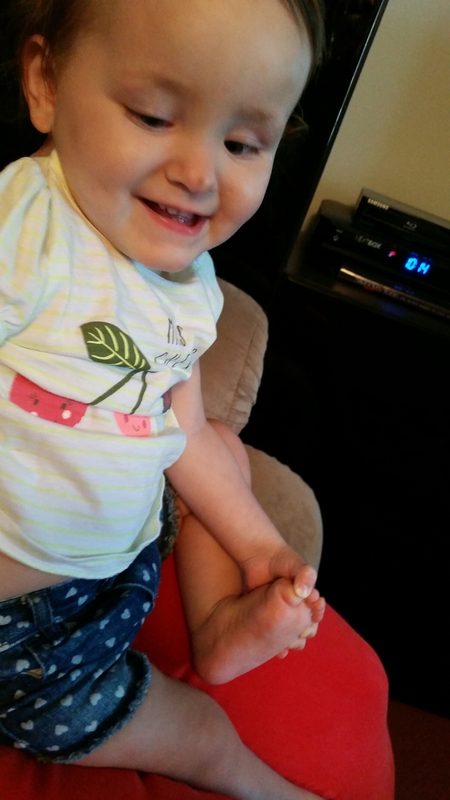 This entry was posted in Baby love, Home is where the heart is, Mamahood and tagged cerebral palsy, hydrocephalus, identical, momo, mono mono, motherhood, NICU, parenthood, parenting, preemies, separation, single parent, special needs, toddler, twins. Bookmark the permalink.